For courses in first-year Composition and R hetoric. With new forms of delivery and expression changing the expectations of writers and audiences, our expectations of writing continue to evolve — and so must today’s writers. 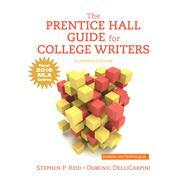 The Prentice Hall Guide for College Writers, Eleventh Edition helps students navigate this territory by fostering rhetorical awareness and asking them to consider purpose, audience, and genre every time they write. Each project chapter guides students with a series of scaffolded assignments, aligned with the WPA Recommended Outcomes for First-year Writing. The rhetorical emphasis, practical step-by-step approach, and predictable structure have made this guide a highly teachable favorite. * The 8th Edition introduces sweeping changes to the philosophy and details of MLA works cited entries. Responding to the “increasing mobility of texts,” MLA now encourages writers to focus on the process of crafting the citation, beginning with the same questions for any source. These changes, then, align with current best practices in the teaching of writing which privilege inquiry and critical thinking over rote recall and rule-following.